1557, Used Rims, 14X5-1/2, 5 LUG, 4-1/4", DODGE, PASSENGER, EAGLE, PREMIER, 12 SLOT, STEEL. 2003, Hubcap used, 15", 68, CADILLAC, 12 SLOT TYPE. 387, Hubcap used, 14", 75-76, DODGE, ASPEN, CHARGER, PASSENGER, EARLY, 12 SLOT TYPE, POLISHED CAP, THIN BLACK PAINTED RING, 12 BLACK PAINTED POCKETS, RAISED CENTER WITH BLACK PAINTED RINGS AND CREST LOGO, METAL CLIPS. 389, Hubcap used, 14", 76-77, DODGE, ASPEN, CHARGER, PASSENGER, 12 SLOT TYPE, MACHINED WITH BLACK PAINTED 12-SLOT TYPE. & RAISED CENTER WITH BLACK RING & CHROME LOGO IN CENTER, 4 SETS OF 3 CLIP. 5040, HUBCAP USED, 15", 75-76, PONT, GRAND PRIX, METAL MACHINED WITH 12 SLOTS AROUND CENTER, WITH FADED BLACK RING RAISED LOGO, WITH METAL CLIPS. 5098, HUBCAP USED, 13", 88-92, ISUZU, PONTIAC, OPTIMA, LE MANS, SPARKLE SILVER, PONTIAC EMBLEM IN CENTER COVER, 12 SLOT, PLASTIC CLIPS & WIRE RING. 5098, HUBCAP USED, 13", 88-92, ISUZU, PONTIAC, OPTIMA, LE MANS, SPARKLE SILVER, PONTIAC EMBLEM IN CENTER COVER, 12 SLOT, PLASTIC CLIPS & WIRE RING. NOTE BOTH MODELS HAVE THE SAME EMBLEM. 57001e, Hubcap used, 14", 65-85, MERCEDES, 200, 220, 230/4, 230/6, 250, 280, 300D, 300E, 380, 450, 500, 600, 12 SLOT TYPE, CHROME OUTER RING, PAINTED MAROON, RAISED CHROME LOGO, 4 METAL CLIPS. 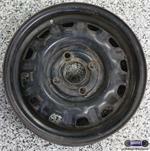 63637b, Used Rims, 13X5, 4 LUG, 100MM, 86-89, HONDA, ACCORD. PRELUDE. FROSTED BLACK, STEEL 12 SLOT. 64664a, Used Rims, 13X4.1/2, 4 LUG, 4.1/4", 86-89, MAZDA, 323, SILVER 12 SLOT, STEEL B=5"
7000, HUBCAP, 15", 94-95, FORD, TAURUS. SPARKLE SILVER, 12 SLOT, TAURUS WORD ENGRAVED IN CENTER, 6 PLASTIC CLIPS & WIRE RING. 7000, HUBCAP, 15", 94-95, FORD, TAURUS. SPARKLE SILVER, 12 SLOT, WITH WORD TAURUS ENGRAVED IN CENTER, 6 PLASTIC CLIPS & WIRE RING. 7006, Used Rims, 15X6, 4 STUD, 100MM 94-96 SATURN S SERIES, 12 SLOT ALUM. 7011a, CENTER CAP USED, FOR A RIM, 15", 99-01, SATURN, S SERIES, DULL MACHINED FINISH. 4 BLACK LUG NUT CAPS, NO LOGO, DOMES CENTER, HELD ON BY LUG NUT CAPS HAS 8 PINS ON BACK SIDE, 6-5/8" DIA. FOR A USED RIM, 12 SLOT, A=MACHINED B= BRIGHT FINISH. 760a, Hubcaps used, 14", 78-82, FORD, MERCURY, GRANADA, MONARCH, 12 SLOT TYPE, MACHINED CENTER. 760c, Hubcaps used, 14", 78-82, FORD, MERCURY, GRANADA, MONARCH, 12 SLOT TYPE, YELLOW CENTER. 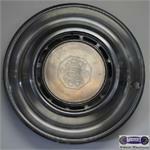 760d, Hubcaps used, 14", 78-82, FORD, MERCURY, GRANADA, MONARCH, 12 SLOT TYPE, TAN CENTER. A-11, Hubcap used, 15", 63, BUICK, LESABRE, WILDCAT DELUXE, ELECTRA, POLISHED OUTER RING, 12 SLOTS, BLACK PAINT BETWEEN RIBS, 6 SPOKES, RAISED POLISHED CENTER, CHROME BACKGROUND, RED, WHITE AND BLUE THREE FLAG LOGO, METAL CLIPS. E-6, Hubcap used, 14", 62, CHEV PASS, SUPER SPORT, CHROME OUTER RING DOMED CENTER, LIGHT GRAY POCKETS, WITH CHROME 3 BAR SPINNER ON CENTER, WITH RED, WHITE, & BLUE WITH RAISED CHROME BOWTIE ON IT, 12 SLOTS ON OUTER RING. METAL CLIPS.